This prefab house design has been getting a bit of a buzz lately, although it’s just a design at this stage. It’s called the Ekoart n.01, and it was designed by Slovenian brand Celovino. Celovino didn’t elaborate on any of the details of this eco- prefab house. But you can probably tell from the photo above already that the most outstanding design feature is probably the symmetrical pattern. 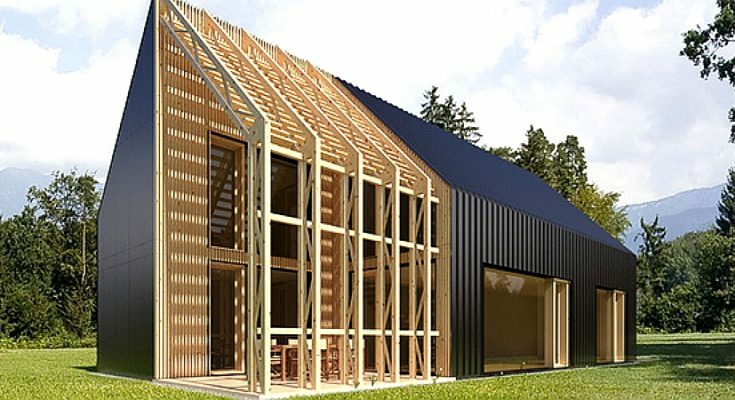 Although it is a corrugated-sheath and peaked roofed throughout, each side has an exposed timber framed area, which can be used as a porch (as it is on the one side) or a carpark (as it is on the other). The symmetry is something like that seen on the face of a card, where the pattern is repeated and looks the same if turned upside down. Interesting prefab design idea, anyway. What do you think? For more prefabs, find them in the Building Homes and Living directory.